Derailleur Hanger Mongoose bikes shop on line. Mongoose Black Diamond 2008 derailleur hanger 6061 T651, made with CNC technology. Black anodized. Lighter and more durable than the hanger series. Mongoose Boot'r 2009 derailleur hanger 6061 T651, made with CNC technology. Black anodized. Lighter and more durable than the hanger series. Mongoose Boot'r Foreman 2011 derailleur hanger 6061 T651, made with CNC technology. Black anodized. Lighter and more durable than the hanger series. Mongoose Fireball 2010 derailleur hanger. Mongoose Nugget 2009 derailleur hanger 6061 T651, made with CNC technology. Black anodized. Lighter and more durable than the hanger series. 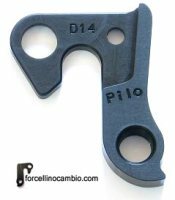 Mongoose teocali derailleur hanger 6061 T651, made with CNC technology. Black anodized. Lighter and more durable than the hanger series. Mongoose teocali 2011 derailleur hanger. Mongoose Teocali Elite 2010 derailleur hanger. Mongoose Otero 2007 - 2008 derailleur hanger 6061 T651, made with CNC technology. Black anodized. Lighter and more durable than the hanger series.